I've read about the debate of "just intonation" vs 12-tone equal temperament. And nowhere it was clearly stated why just intonation is impractical. Here are my assumptions. Please let me know if I am correct. Just intonation frequencies are based on the harmonic series. A fundamental tone is picked and then all of its harmonics are transposed within one octave (that is, in the range of the first two harmonics). The first N harmonics account for 12 different notes in that range. However, if an instrument is tuned with the frequencies obtained in the above manner, the instrument only sounds good in one key. In other keys it sounds out of tune (because the frequency ratios for the intervals are not simple integer fractions like 3/2). For that reason the 12-TET tuning system was developed, so that the same strings can be reused in all keys without sounding out of tune (and without the need to re-tune the instrument when changing the key). What is not clear is why this is the case. The Harmonic series should produce harmonic sounds. At first it looks they don't and therefore a "hack" is needed. My guess (please refer me to a source explaining it) is that the harmonic-series-derived tones sound good in the key based on the tone that was chosen for the fundamental frequency for a given series. So if we choose C3 as the fundamental frequency, all intervals will be OK in C-major, but will be out-of-tune in A-major. For them to "work" in A-major, we need to pick A3 as the fundamental frequency and calculate and transpose the harmonics. Thus the 12 (or 24, or whatever) notes will have slightly different frequencies depending on the key. The compromise of 12-TET is made so that an instrument doesn't need hundreds of keys/strings in order to play in multiple keys. Yes, you're right. As for why the harmonic series doesn't produce notes that work in all keys, the simple answer is that the math just doesn't add up. Let's work out the math for just intonation: Suppose you choose X Hz for the fundamental frequency and go from there. Then the octave above the fundamental should have frequency 2X Hz. Meanwhile, the perfect fifth above X will have frequency 3⁄2 X Hz. The perfect fifth above that will have frequency 3⁄2 * 3⁄2 X = 9⁄4 X Hz. Continuing on the cycle of fifths, you can easily see that every pitch generated this way will have frequency (3⁄2)n X Hz for some exponent n.
If there are twelve tones in the chromatic scale, then (3⁄2)12 X should be some whole number of octaves above X, i.e. (3⁄2)12 must equal a power of two. But this is impossible because no power of 2 can have 3 in its prime factorization, as all powers of 3⁄2 must have. Indeed, if you don't insist that the chromatic scale have twelve tones, you still can't make the math work: (3⁄2)n != 2m for any positive integer values of n and m.
Is it close, though? Not close enough. (3⁄2)12 = 129.74, and the closest power of 2 is 27 = 128. In practical terms, this means that the A one octave above A440 is 440 * 129.74 / 64 = 892 Hz, which is definitely audibly distinct from the pure 880 Hz you'd expect. The math just doesn't work—just intonation cannot produce a set of pitches that work well in all keys. Alex Basson has given you a great introduction to the mathematics. Let me approach the answer from a different perspective, that of the performing musician in a historical context. Setting the mathematics aside, to put it simply, just intonation is what happens when you have a group of singers performing a capella, or a string quartet, or any other ensemble of monophonic instruments that can inflect or bend their pitch. But as soon as you insert a conventional piano or guitar (which are tuned to 12-tone equal temperament) into the ensemble, all the other instruments and performers will shift from just intonation into equal temperament so as not to clash with the guitar or piano. Singers and string players don't consciously think about it; it just happens. There are also instruments in existence that play only in pure just intonation. These are instruments that can only play one scale in one key, and no extra notes outside of that. They include the natural trumpet or bugle (which have no keys, no valves, and no vent holes), or certain designs of the recorder, or the bagpipes. Just intonation is extremely impractical for instruments that play chords (guitar or piano), or any instrument with fixed pitches which cannot bend, such as vibraphone or marimba. How many keys do you want in an octave on your keyboard? In the Baroque period, 12-tone equal temperament had not yet been invented. Although the early harpsichords and organs had 12 notes to the octave, they used various tuning schemes that were based on just intonation. Each instrument could only be played successfully in a few keys with the tuning scheme in use. To expand on that, innovative designers in the 1500s and 1600s built a few organs and harpsichords with between 14 and 36 different pitches/keys within one octave to be able to play in something closer to just intonation in many keys. To say that learning to play a keyboard with that many keys in an octave was an added difficulty to the keyboardist is an understatement. It also meant that harpsichords and organs had to have extra strings and extra pipes to play the extra pitches, adding significantly to the cost and the mechanical difficulties of building and maintaining the instrument. This problem was largely resolved when the "Well-Tempered" tuning was invented and subsequently championed by J. S. Bach. Later on, true 12-tone equal temperament was developed. Around this time, most keyboard musicians lost interest in keyboards with extra keys/pitches for approximating just intervals in various keys. 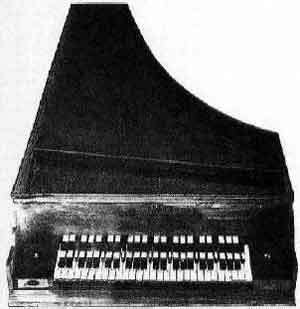 there have been several designs for a just-intuned keyboard for electronic musical instruments, with many more than 12 keys/notes in an octave. I know of one electric guitarist, Jon Catler, who plays guitars built with extra frets to make 31 equal-tempered notes in an octave. His purpose is to play conventional tonal music that enable a skilled performer to get close to just-intoned intervals in many keys; he's not composing and playing exotic non-Western scales or music. Lately he's been recording on a new guitar he designed with 64 notes in an octave that he says achieves just intonation in all keys. Below are pictures of two guitar designs which he sells, and below that is a video demonstration, playing a guitar of yet a third design. Not many guitarists would want to learn to play one of those instruments. Take a close look at those frets on those fingerboards and you will see why just intonation on a guitar is impractical for anybody but a select few avant-garde musicians who want to go to the tremendous trouble to develop a very complicated playing technique in the name of creating more pure intervals. I want to make an addition to all these excellent answers. With just intonation, it's not possible to make all the chords just. Not even in a single key. In this scale, I, IV, V major triads (4:5:6) and iii and vi minor triads (10:12:15) are just. But ii minor triad is out of tune: D-F interval is 32:27 instead of 5:6. This is ~294 cents vs 316, which is worse than the equal tempered 300. Worse yet, D-A interval is 40:27 instead of 3:2; 680 cents vs 702, again way worse than the equal tempered 700. One way to fix it is to flatten D down to 10:9 but this will break the V major triad. There's simply no way of making them all just without adding more notes. Not even in a single key. I have come across an even more astonishing system for producing pure intervals on a guitar. 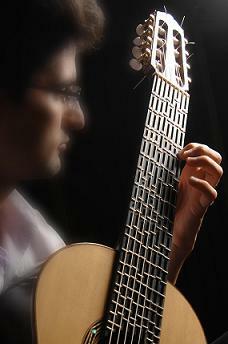 A Turkish guitarist, Tolgahan Çoğulu, has patented a system for building a guitar that has channels under each string position that allows the quick installation or removal of any number of tiny partial frets, each one string-space wide, which can be adjusted up or down to any arbitrary microtonal position by hammering on them with a small "spudger" tool. The performer would be able to recalibrate all the fret positions and intervals of the entire fingerboard any time the performer wishes to play in a different tuning system. Apparently it was developed for the Turkish style of music called maqam, which uses quarter-tone intervals not found in Western music. But the luthier also demonstrates its use in Western music that uses equal temperament or meantone tuning systems, and mentions that it would be useful for playing Western Renaissance or Baroque pieces. In these two videos, he provides a technical description, narrated in English, and demonstrates the use of his instrument in playing excerpts from several different traditional compositions from different historical periods in Turkish and Western music. His website indicates that he will build and sell many styles of guitars and other fretted instruments (not just classical guitar) by special order, but few details are provided. Using a keyed instrument with Just Intonation creates a bunch of puzzles that need to be solved. You are either faced with observing limits on navigating from place to place, or doing "comma pumps" (equating near by intervals, or bend/vibrato between them because they are close enough). The problem isn't really Just Intonation though. It's caused by trying to play on an instrument that has a set of keys (and notating it as such), rather than being continuous. In other words, named keys may be a bad interface for Just Intonation. On a fretless instrument, JI is not only practical, but the sensible way to navigate. Stopping a string to an existing note and playing a seventh harmonic there (ie: notePitchInHz * 7) is completely natural and can be described easily enough, but that note doesn't have an obvious 'name'. People already use pitch lattices which were derived in this way; like horizontal is *3, vertical is *2, etc. Just intonation does produce harmonic sounds; perhaps the most harmonic sounds possible. You are correct that for a Justly tuned system to work, then each of the tones that you use will need to be adjusted relative to the current tonic. Because of this, you are correct to think that there will need to be many different 'flavors' of each note, depending on the context. There has been enormous work done in this field many composers and scientists over many centuries. The source I choose to share here is the work done by the American composer Ben Johnston. This is an example of the notation he used to distinguish between each specific note, and they are created by performing simple mathematical operations (basic arithmetic). I will give a brief explanation of Johnston's system here, and relate it to your question. Johnston's motivation was to pretend as if Twelve-Tone equal temperament never became a popular trend: he pretended that composers had thought it important to explicitly describe intonation through their notation system. Of course, this is not what happened, so he had to create a system of his own. You could think of his system as a way to get from one note to another without having to explicitly define EVERY NOTE that one would need to use. This might seem confusing, so let me define something that should be familiar: the Major scale. then the intervals between each note will follow the pattern of whole (W) and half (H) tones below. This pattern holds if you are using a piano, where each whole tone is 'equal' to every other whole tone. BUT in just intonation, this assumption does not hold. In just intonation you define EXACTLY what the value of a whole tone is, as well as EVERY OTHER INTERVAL YOU USE! These five intervals are enough to make simple harmonic chords! We begin with the octave. Then we split that into two intervals: the Perfect Fifth, and the Perfect fourth. Next, we split the perfect fifth into two pieces: the Major third, and the Minor third (notice how the numerator of the previous ratio becomes the denominator for the next ratio, and the numbers are growing by a succession of 1). Now we just need to split the thirds into smaller intervals so that we can have melodies that can go up and down smoothly. One of the simplest ways of doing that is to build Major chords that can be 'stacked' into each other. Why major chords? Because it's a fundamental chord within the harmonic series. So if we use the major chord as a pattern, and copy it a few times, we can produce a set of the notes within the major scale. By doing this, we're making a very simple scale, and only using three prime numbers: 2, 3, and 5. (Johnston's system can accommodate prime numbers up to 31, and anyone could theoretically extend it to include as many primes as they wish). If we use the first three intervals of the harmonic series for the parameters of copying the Major chord, we will get a good amount of pitches to make our scale. We start by shifting the pattern up to start on the pitch a perfect fifth (the ratio 3/2) above the tonic. Then we copy the pattern onto the pitch a perfect fifth below the tonic (equivalent to a perfect fourth above the tonic, but it is less cluttered to go below for now). Why is this important? Well it shows that Just intonation, as you noticed, introduces a lot of variety when it comes to intervals. This means you need to pay special attention to how each note relates to every other note. This is hard to do on paper, but composers like Ben Johnston and Toby Twining have been doing it for many years, and so they have much to teach those willing to listen. In conclusion Bozho, it is not unpractical to compose music using Just Intonation. That being said, it is not easy. If more composers chose to take up the challenge, then we might develop more tools to make the job more efficient. For now, there is still much work to be done. A relatively new company in Sweden, True Temperament, retrofits electric, acoustic and classical guitars with new necks or fingerboards with heavily modified fret positions that are designed to improve intonation. If I understand their intent, their "Thidell" design is for playing with something closer to pure intervals, but chiefly in the most common guitar keys of E, A, and D. The further you get away from those keys, the less accurate the intonation gets. They also have several other designs for producing other kinds of intonation more suited to other purposes. For instance, they make an entirely different fret layout for playing in the keys more commonly found in jazz. This looks like a compromise that might work. I have not seen, heard or tried any of their necks or instruments but there are demo videos and audio on the web site. Notice that there are 14 frets to the octave, because apparently (I have not worked through the music theory) certain chords require a sharper or flatter major or minor third than can be provided by only 12 fret positions. So based on the chord, you could choose a G# or an Ab which have distinctly different microtonal pitches, for example, depending on which pitch would produce the correct, in-tune interval in that particular chord. Here is a table that I have adapted from one in Wikipedia that illustrates how just intonation differs from 12-tone equal temperament. In modern instrument tuning, an octave is divided into 1200 cents. There are 100 cents in an equal-tempered half-step, and all half-steps are equal in their distance apart. However, in just intonation, not all half-steps are the same size. This table explains the discrepancies, and shows you just how out-of-tune certain musical intervals are on the 12-tone equal tempered piano, organ, synthesizer or guitar. As you can see, in 12-tone equal temperament, all intervals except the octave are slightly out-of-tune. The intervals that are the most noticeably out-of-tune are the tritone, the minor third, the major sixth, the major third, and the minor sixth. Also note that just-intoned intervals cannot be expressed as integer values of cents in the first place. The cent is a convenient mathematical measuring unit based on 12-tone equal temperament. So the unit of the cent really has nothing to do with pure frequency ratios. For them to "work" in A-major, we need to pick A3 as the fundamental frequency and calculate and transpose the harmonics. This is one of the bigger misperceptions about just intonation. A perfect fourth is not an overtone (it is an undertone), so if you want to play music in which the perfect fourth plays a significant role — which, let's face it, is pretty much anything in Western music — then you need to use a harmonic series starting down at the fourth. That is, if you want to play in the key of A, your fundamental frequency should be D, not A. That will give you a nice, harmonic D chord. I see a lot of comments here focusing on fifths not closing on octaves, but it's not obvious to me why that should matter. Most songs — especially in folk music — don't modulate all over the place. They stick to chords near the home key, and as long as those are in tune the rest don't really matter. For example, if you're playing in C (using the harmonic series of F₀), you'll have perfect tuning for the intervals in the chords C⁷, F⁷, G, A, Am, Em, and Bm. The fifth of the Dm chord will be off by a syntonic comma (around 21.5¢). I don't know about you, but I can play a lot of songs using those chords. Just intonation is only impractical if you insist on having a scale of more than six fixed steps, with all the intervals being 5-limit just. God and/or math doesn't work that way. The most cogent way of putting it is this: no power of two is also a power of three, and no power of three is also a power of five. I can strongly recommend reading Harry Partch's Genesis of a Music, in which he goes into depth on the history of tunings and the reasons for them. Out of this he derives his 43-tone-to-the-octave scale from an 11-limit just scale, and then talks about the instruments he had to build and adapt to play music in this scale, and the compositions he did using them, in detail. The 43-tone scale is a compromise to produce a better compromise, but 43 keys in every octave is definitely not practical. You can find some of his music on YouTube, and I recommend listening to it, especially with the book in hand. I recently found a performance of Delusion of the Fury which is very good and very interesting indeed. And I almost forgot: Terry Riley's The Harp of New Albion uses a piano tuned to a 5-limit chromatic scale. See http://www.ex-tempore.org/Volx1/hudson/hudson.htm for details. One of the best microtonal instruments may be the slide guitar. Listen to Duane Allman play slide guitar, or David Gilmour play lap steel, or countless others. Not only do they reach the tones between the notes, but I suspect that they are naturally gravitating to the just tempered notes as well. That purity is what makes skilled slide guitar players sound so sweet. The key difference between slide and the aforementioned multi-fret guitars is that slide is an adaptive process that relies upon the player. And the player will naturally play what sounds "right". If you only think about the fixed frequency instruments, just intonation is not good for the instrument construction, there is good examples for the guitar above. There will be technical difficulties with a piano and other instruments too. But for continuous variation pitch instruments, the just intonation will have more natural sounding. There is a good example of what happen in the sound waves in this youtube video. You can see that just intonation is stable. has no solution for integer n and m. Therefore, no sequence of just-intoned fifths, therefore, will ever reach an octave perfectly, no matter how far you go. So there is no equal temperament scale, no matter how finely divided, that will result in one of the notes being a perfect true fifth. I'd like to add to Cyco130's comments. One cannot always combine different intervals to get another useful interval. This has implications for tuning a guitar by ear (without using the frets). One starts with the E string and goes up a fourth to A giving a ratio of 4/3. Thence up another fourth to D yielding 16/9 and so on to G arriving at a ratio of 64/27. Now a different interval or a major third (5/4) up to B, giving a ration of 320/108 (reducible to 80/27). Finally another fourth to the high E string giving a ratio of 320/81. This ration is very close to 4/1, the ratio for two octaves. Two musically correct paths to the "same" note do not lead to the same note. In the case given above, one may have nice intervals for C, G, and F chords but then the d minor chord is out of tune. The IV and ii chords have been treated as similar for centuries though (5-6 techniques). Saying that just intonation is based on relationships in the harmonic series is just a glorified way of saying that just intonation is based on natural number ratios (because the harmonic series is all the natural numbers to infinity). The issue of just intonation is that nearly all music implies the use of more notes than are explicitly written, while most modern fixed pitched instruments revolve around only using 12 notes per octave. 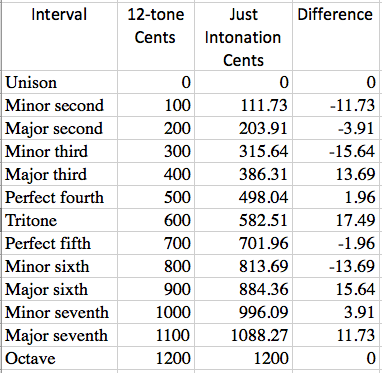 Because these implied extra notes are only 20-50 cents away from each other, 12TET was implemented to make it so that performers only had to keep track of 12 pitches per octave by roughly averaging out the extra notes that were fairly close to each other. The notes in just intonation that are a small distance apart are either notated with the same letter or are notated as enharmonic equivalents when using 12TET, which is where the misconceptions and confusion about just intonation begins. The truth about why it seems as though just intonation "doesn't add up" is that western notation is to blame. It is often the case that someone will set up a demonstration of how just intonation doesn't work, and then they'll either assume enharmonic equivalence, which is something that can only be assumed in equal temperament, or they won't distinguish Pythagorean ratios from 5-limit ratios (less common). The reason why a given set of just intonation pitches only work for a single key is that when choosing another root (i.e. modulating), the ratios of the degrees in the scale are no longer correct. For example, in a JI tuning based on C, the frequency of D (major 2nd) is 9:8 of the root, while E (major 3rd) is 5:4. Taking D as the root, suddenly the major 2nd (now E) is not a ratio of 9:8 but (5:4)/(9:8) = 10:9, so the major 2nd comes out flat. Choosing different root notes produces more or less dissonant tunings and in fact some intervals work out correctly (e.g. taking the perfect fourth F, the new major second G is correctly at 9:8 ratio from the root), but only the original root works in relation to all pitches. This also applies to other modes than the major - an instrument tuned in just intonation can only properly play one set of modes. This situation is avoided in equal temperament because the pitches are a geometric progression and the ratios between pitches depend only on the number of steps between them. Doing the math you get F#:G = B:C = 243:128 = 1.898438 and Gb:Db = Db:Ab = Ab:Eb = Eb:Bb = Bb:F = F:C = C:G = 4:31; multiplying all the ratios and dividing by the closest power of 2 gets you Gb:G = 4.36/4 = 1.872885 - so you can't have true Db major and G major scales using the same 12 chromatic pitches. 1 This is fudging it a little; in just intonation, the pitch of any note, and its ratio to any other, depends on the question "in which key? ", and the ratio Gb:G doesn't make sense in any case since no key contains those two notes. Here we're talking about the major keys of the G and Db that we get by walking the circle of fifths and comparing the Gb in Db major to the G in G major (and the F# in G major to the G in G major respectively). The point is that in any key that contains a tone called F#, the pitch of that tone is different from any tone called Gb in any other key. It is neither easy nor difficult to compose in JI, it is not a significant part of the history of western music, especially over the past 600± years. JI is based on the fundamental. Western music in developing tonality is based on sets of hierarchical relationships where 'scale degree' ^1 is more important than ^5, and harmonically, ^5 is more important than ^2, etc with ^2, ^6, ^3. Using JI for tonal harmony, while interesting, has no historical, or acoustic basis. "Why is Just Intonation Impractical?" The true answer is: It is actually the most practical way to tune and generates the 12 ancient keys of music. When a 12 tone instrument is tuned properly to the correct 12 just pitches, you will have 12 beautiful keys to play in that are based on the laws of harmonics, and yes you can easily modulate between keys. 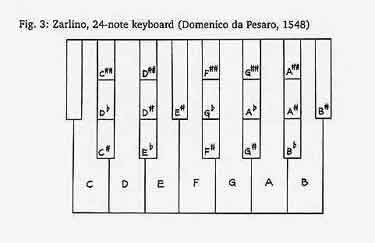 Indeed this tuning is the real basis of the idea of "keys" of music. It has been "lost" since before the Renaissance. Strange as it may sound, several years ago I recovered it. Anyone who can do simple math and listen to examples of the sounds will see I am right. For a concise summary of this with examples of songs played in the 12 ancient keys, go to Unfretted dot com to the Other Instruments Forum to the thread, 17 Tone Just Intonation Guitar and scroll to my posts that begin July 17, 2018 (ignore earlier). p.s. Ask yourself, where did the idea of playing music in various keys come from? Certainly not from "modern tuning". Equal temperament has no keys to speak of, they all have the same feel, as the proportions one note to the next are identical. It takes variety to have keys of music. Other tuning systems have variety, but they are based on make believe numbers. Just intonation, on the other hand, is based on real math. Whole numbers are the basis of vibration in the real world. For example the harmonics you hear when you tap on a guitar string at certain points. One of the flaws in the answers given here is the idea of expressing musical intervals in the singular sense, such as "the fifth". A properly tuned 12 tone instrument will have a variety of fifths. Indeed it is this irregularity that gives us the keys of music. But you need the correct pitches to make it all work. I have found them. They were sitting right under everyone's nose. Not the answer you're looking for? Browse other questions tagged theory tuning harmonics intonation just-intonation or ask your own question. Does good intonation alone really make you “louder”? If yes, why? What determines the relative volumes of the harmonics when plucking a guitar string?